I have been accused by many in comments to my articles that I continue to write about the pogrom in Aluthgama and Muslims while the Tamils have had to undergo state terrorism during the 30 year ethnic conflict. For them, the two deaths and billions worth of damage is minor compared to the death of over 200,000 people and trillions worth of damage during the long drawn ethnic violence against the Tamil population. While none can justify another, it is important that we as a nation learn to deal with our differences and live as a strong Sri Lankan community, celebrating our religious and cultural diversity. No one, not even Buddhist monks should be allowed to act with impunity and to cause violence or take the law in to their own hands. Sri Lanka has seen in recent history thugs in saffron robes who don’t respect the laws of the land, and who act with impunity, leaving a trail of destruction, not only material but also destroying good relations between communities. Successive governments continue to either encourage, or at least, look away while these so called priests engage in hate and violence. There is an urgent need to reach out to the moderate Buddhists who do not subscribe to this saffron violence. The majority of peace loving Buddhists in this country should act to stem religious hate and violence and ensure that law and order prevail, since Sri Lanka is a nation that prides in its rich cultural traditions and Buddhist values. 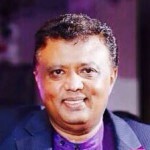 Just two years after the violence that caused death and destruction to Muslim lives, businesses and property worth billions of rupees in Aluthgama and Beruwela, the Bodu Bala Sena’s call in Mahiyangana on the 21st of June 2016 for a repeat of Aluthgama is a dangerous threat to peace for all Sri Lankans. This time, the threat from Ven. Gnanasara and the Bodu Bala Sena is not targeted just at the Muslims, but also at the Police and Judiciary. He demands that the Police and Judiciary release two youth who were arrested for intimidating businesses to close their shops to protest against a previous incident involving an intoxicated Muslim youth who had pulled down a Buddhist flag. He and his supporters around him threaten that failure to comply with their demand would force them to take the law in to their own hands and get the youth released with mob violence. Ven. Gnanasara clearly states that this could be the next phase to the violence in Aluthgama. The threat of repeating Aluthgama is tantamount to admission of responsibility for the pogrom of Aluthgama on the 15th of June in 2014. The Bodu Bala Sena has restarted its hate campaign against the Muslims after a lapse of about year and a half since the electoral defeat of Mahinda Rajapaksa in 2015. The BBS continues to bundle various incidents and issues including an internal rift between teachers, old boys and the Principal of Madeena Muslim Maha Vidyalaya, in Madawala Kandy. Some parents and old boys of the school had thrown rotten eggs at the Muslim Principal of the school where a Sinhala teacher had sided with the school head. This incident has been portrayed as a communal rift between the Sinhala and Muslim teachers when the Principal himself is a Muslim and the Sinhala teacher had sided with him. The local police had intervened and warned all parties to refrain from any form of violence, and the matter was resolved. Yet, Ven. Gnanasara and the Bodu Bala Sena are presenting this as an assault on a Sinhala teacher, while the target of the old boys and parents had been the Muslim Principal. Buddhist extremists led by some monks had also prevented the establishment of a Muslim primary school in Dambawinna, Welimada. The Welimada Muslim Maha Vidyalaya, located in the heart of Welimada town had to expand due to the growing educational needs of the local Tamil and Muslim population. The school decided to shift its junior section to a separate location with the approval of the Ministry of Education and the Government had allocated the land in Dambawinna. A ceremony was organized to lay the foundation stone for the new building by the Uva Province Chief Minister Sammara Sampath Dassanayake, but a small group of Buddhist extremists led by a few young monks prevented it. They protested, stating that this area was allocated for government offices, which led to unnecessary tension in the area between the two communities. Chief Minister of the area confirmed that the Education Ministry had allocated the land for the school. The Bodu Bala Sena, recently accused the two sons of President Mahinda Rajapaksa, Namal and Yoshitha to have caused the defeat of the Rajapaksa presidency. The sudden blaming of the Rajapaksas is interesting and is seen as an attempt at shifting BBS allegiance to the Maithri-Ranil administration, especially when the joint opposition is at the Government with its rhetoric of government failures. How much of the BBS bait, the Maithri-Ranil government will swallow is yet to be seen. The continued hate of extremists against minority communities is a major threat to peace and development in the country. The Geneva resolutions and the support of the international community towards lasting peace in Sri Lanka should not be undermined. The Organisation of Islamic Countries (OIC), who continued to support the Sri Lankan State against the various resolutions brought by the West and the USA should not be alienated. The Muslim Council of Sri Lanka has been demanding a special commission of inquiry to the hate campaign against the Muslims and evangelical Christians and punish as appropriate the perpetrators. It has had no response from the Government since January 2015. It has also continued to maintain that anyone breaking the law should be taken to task within the framework of the law, and that vigilante groups shouldn’t be the ones who take the law into their own hands, which will demean the Police and the Judiciary and cause a breakdown in law and order. It is time that we as a nation came together to meet the development challenges of our nation and help usher in an era of peace and prosperity. Towards this, every citizen will have to make his or her own contribution. The peace loving citizens should ensure that extremism in any form or from any religion should be eliminated. Brexit - A One-Night Stand In Political Decision Making? Ganasaras, Kattadiyas and all sort of characters will disappear when the economy is well controlled and the people who go after such characters have to concentrate on their economic advancement. That is the responsibility of the Govt. That is the last thing this govt is concentrating.The economy will improve and the people will be happy if they have rational policies. What are they doing, crippling the paddy industry with a flybynight scheme.Why did they ban Glyphosate? The madness with asbastos,all this add to man’s insecurity and the survival of safron robed gents like Gnanasara and Kattadiyas. Govt cannot clear he path to Nirvana rather it can clear the path to hell. Why are they worried about the Asgiriya man? Tell him to go to hell. It is a pity the current government is tolerating such speeches of hatred despite the past experience with this 3rd class thug and his henchmen. This government should inact new laws to stop such hate speeches and any kind of degrading another religion and make it severely punishable to those commit such crimes. This is the only way to give the powers to the security services to arrest such criminals and lock anyone up, whether it is a clergy or otherwise. Just because such criminals wear a monks dress no one should be above the law. This terrorist didnt learn the lesson still and he and his henchmen should be brought to the courts and sentenced for the crimes.